Research metrics give a balanced, multi-dimensional view for assessing the value of published research. Based on the depth and breadth of its content, Scopus works with researchers, publishers, bibliometricians, librarians, institutional leaders and others in academia, to offer an evolving basket of metrics that complement more qualitative insights. Throughout Scopus, you can access multiple metrics at the journal, article and author levels. 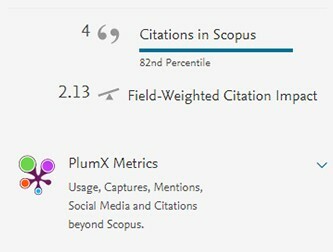 In July 2017, PlumX Metrics were integrated on Scopus, providing measurable ways to understand how a piece of research is being used, interacted with, shared, promoted and cited. To learn more details about PlumX Metrics and how to use them on Scopus, watch our recorded webinar featuring Andrea Michalek, Vice President of Product Management for Research Metrics at Elsevier and co-founder of Plum Analytics. CiteScore Tracker helps you keep current with how a title’s CiteScore is building each month. Along with the June release of CiteScore 2016 annual values, CiteScore Tracker 2017 was also initiated and has been steadily building monthly. When looking at titles to read, follow or publish in, CiteScore Tracker offers a timely look into how a title’s impact is tracking. CiteScore metrics: A family of eight indicators that offer complementary views to analyze the publication influence of serial titles of interest. Derived from the Scopus database — almost twice the size of the next-leading abstract and citation data provider — CiteScore metrics offer a more robust and accurate indication of a serial’s impact. SCImago Journal Rank (SJR): A prestige metric that can be applied to journals, book series and conference proceedings. With SJR, the subject field, quality and reputation of the journal have a direct effect on the value of a citation. Scopus bibliometrics can help you assess an individual author’s research output and scholarly impact. The depth and breadth of content on Scopus—which includes 2.5 million pre-1996 recently added record—provides the quality data needed to build accurate measurements of an author’s impact.